As discussed back in March, the US coal sector is facing severe headwinds as the power industry shifts to natural gas. That trend has now become quite evident based on the latest data from EIA. 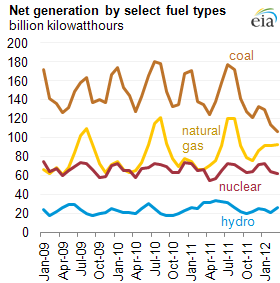 Net generation using coal has declined sharply on an absolute basis. 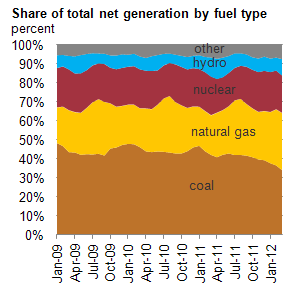 And on a relative basis coal is becoming a smaller component of the net. Given the US natural gas supply fundamentals, this trend is likely to continue.